In einem der exklusivsten Bezirke Bangkoks ragt das St. Regis Bangkok über dem niemals verstummenden, vielfältigen Hintergrundrauschen dieses geschäftlichen, kulturellen und kulinarischen Zentrums im Südosten Asiens auf. Senden Sie eine Anfrage nach Verfügbarkeit mit Ihrem gewünschten Daten an die The St. Regis Bangkok. Features 1 King bed, mini fridge, city view and Wi-Fi Internet. Features 2 Double beds, mini fridge, city view and Wi-Fi Internet. Features 1 King bed, views of the Bangkok skyline, mini fridge, TV and WiFi (for a fee). Features 2 Double beds, views of the Bangkok skyline, mini fridge, TV and WiFi (for a fee). Features 1 King bed, mini fridge, spacious living room and WiFi (for a fee). Features 1 King bed, mini fridge, spacious living room and Wi-Fi Internet. Features 1 King bed, mini fridge, dining area, living room, golf course view and Wi-Fi Internet. Features 1 King bed, mini fridge, dining area, living room, spectacular views and WiFi Internet. Features 1 King bed, mini fridge, living/sitting area, dining room and Wi-Fi Internet. Features 1 King bed, 2 Double beds, 2 bathroom, mini fridge, microwave, living/sitting room and Wi-Fi Internet. Features 1 King bed, 2 Double beds, 2 bathrooms, mini fridge, floor-to-ceiling windows, city views and WiFi Internet. Features 1 King bed, 2 Double beds, 2 bathrooms, mini fridge, microwave and Wi-Fi Internet. Features 1 King bed, mini fridge, microwave, living/sitting area, dining room, coffee/tea maker, TV and Wi-Fi Internet. Features 4 King beds, 4 bathrooms, fully equipped kitchen and a grand living room. Features 3 King bed, 3 bathrooms, mini fridge, microwave, private infinity pool, exercise room and spa area. Room with 1 King bed, desk and a view of the city. This room features plenty of natural lighting thanks to floor-to-ceiling windows and a large working desk. Features distinctive Thai decor, natural lighting, floor-to-ceiling windows and a large working desk. 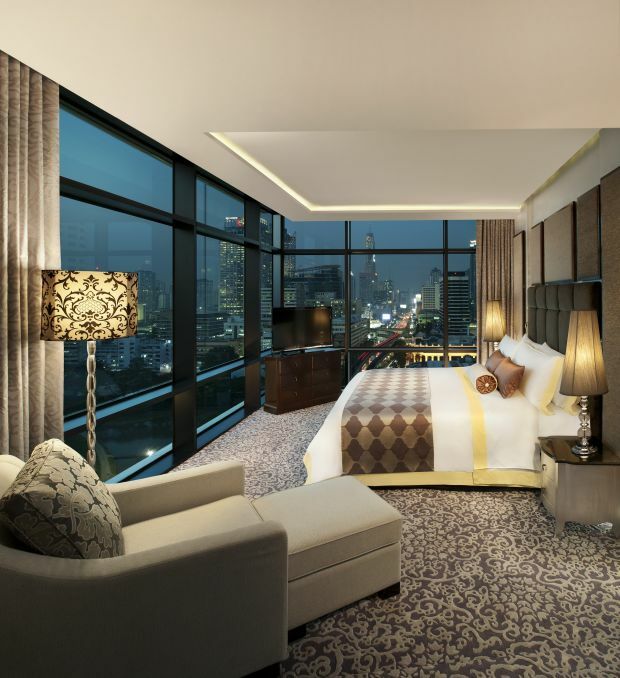 Room with 1 King bed, sitting area with sofa and a view of the skyline. Room with Twin bed, sitting area with sofa and a view of the skyline. Suite with 1 King bed, living room, and floor-to-ceiling windows. Suite with 1 King bed and separate living room. Suite with 90 degree views of the city and golf course. Two bedroom suite with two bathrooms, with 90 degree views of the city and park. Features two bathrooms, two bedrooms and stylish Thai interiors. Suite with 90 degree views of the city and golf course. Located on the 24th floor. 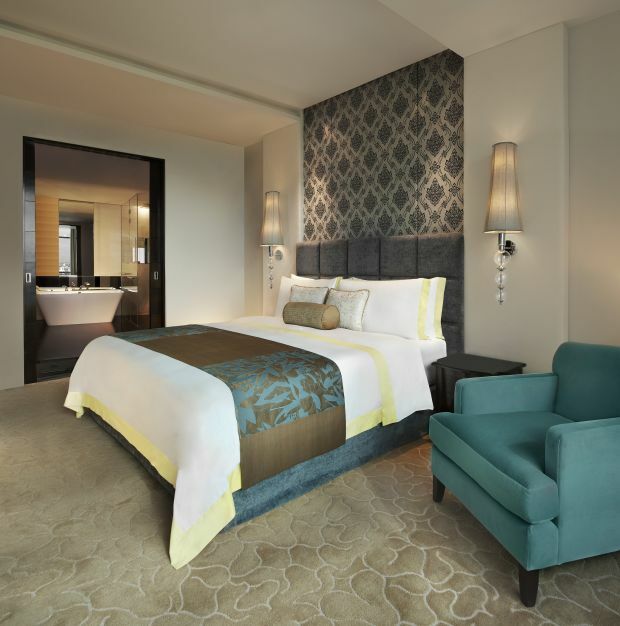 Suite with Signature bed, refined Thai decor, large window and sitting area. Two-story Residence with sophisticated elegance and luxurious decor.